After a wonderful send off from Holyroodhouse this morning, with my husband, Father-in-law and inspirational DofE young leaders to wave us off, we headed out of Edinburgh under clear blue skies. Having never experienced any problems with the bikes before, of course Rachel and I both suffered chain malfunctions within 30 minutes of departure. Fortunately it happened some way into the ride and not in public view - without a chain you can still peddle but you won't get very far! The villages soon started to fly past and after two hours and 25 miles it was time for our first pit stop in the town of Lauder. Quite what they thought of a group of people in brightly coloured Lycra descending on the place and eating them out of cake I don't know but they were very welcoming! Cake is proving a theme for the day after one of the DofE young leaders from this morning, a Gold Award holder with great experience of expeditions, told me how her Aunt's fruit and coconut cake had kept her going. Unbeknown to us she had also delivered some to the DofE to pass on, so much of the day was spent sampling this very delicious recipe (thank you Auntie!). Our next stop was in the historic town of Jedburgh where we had a few moments to look at the ruined Abbey and stop for lunch (in a very salubrious car park!). Before long we were back on the road and it was time to head up the hill that marks the border into England, posing for some pictures on the way. The hills have actually been a pleasant surprise (so far). I had built them up in my head into walls of doom but they have not been nearly as brutal as I had imagined. Long may that continue! After over five hours cycling I noticed my energy was starting to dip. Looking down I realised we had cycled over 70 miles and were thankfully not far from home for the night. It's been a great day and I've really enjoyed it. We've had good fun, keeping each other going up the hills and on the long roads, Rachel has even offered to sing, but thankfully we haven't had to resort to that...yet! Roll on tomorrow! Day two and this morning we met some fantastic young cadets taking part in the DofE. It was a pleasure to meet them and the children and DofE volunteers from Northumberland Church of England Academy who joined with the cadets to wave us off from Otterburn. As we pushed off from the side of the road poor Jo got stuck and landed sideways on the pavement. I always feel for anyone doing that as it’s a painful event and I feel sure it’s only a matter of time before it’s my turn! The view of the mist clearing over the rolling hills of Ridsdale this morning is a sight I will never forget. It was a magical start to a ride which quickly became a feat of endurance. The beautiful Northumbrian hills are like a particularly relentless rollercoaster, although the joy of going down them almost makes up for the pain of cycling up them! (I said almost). There was never much of a let up and I had to dig deep and push on, finding my happy place as often as possible. However, we managed a good 45 mile per hour descent on one hill, breaking my previous records. The good weather has followed us from Scotland through Northumberland and we took advantage, sitting in the sunshine at our first pit stop 20 miles in at the pretty village of Corbridge. We hoped this would give us enough energy to go another 35 miles before lunch but the hills and more particularly the time got the better of us and a proper rest and refuel was called for. After lunch we were off for the remaining 30 miles to our stop for the night. While some of it was blissfully flat or downhill, there were still a few cheeky long up hills thrown in just to keep us on our toes! Now day two is over I want to thank everyone who has supported us so far. It means so much to all the team and everyone at The Duke of Edinburgh’s Award and is certainly my inspiration when I am struggling up another one of those hills! "I'm really happy to have completed day two, I knew it was going to be the hardest" Another 75 miles down, 300 miles to go. 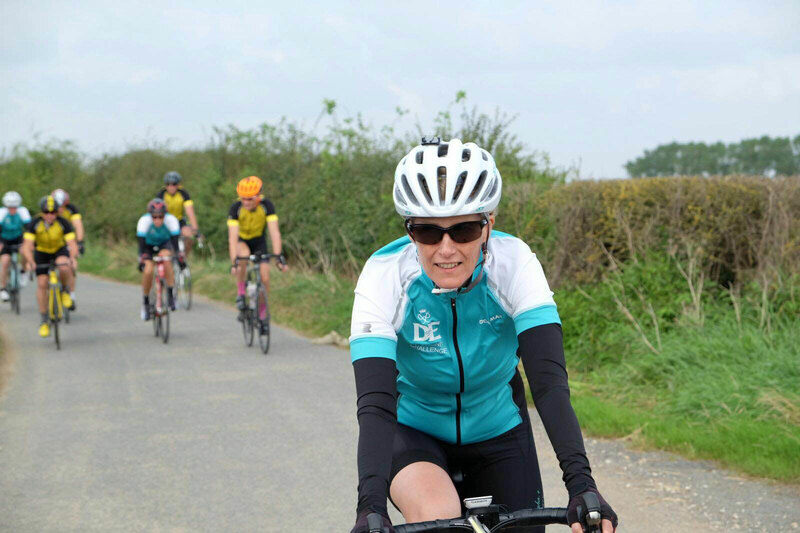 The Countess of Wessex shares the highs and lows of day two of her #DofEChallenge! Find out how you can support HRH's challenge and The Duke of Edinburgh awards - click the link in bio. After our mammoth day over the hills of Northumbria yesterday we were all looking forward to a slightly easier day. The 50 miles from Catterick to our next stop wind across gently sloping countryside and we were excited about heading off. Young people from Richmond School and Queen Ethelburga’s came to wave us off. They were hugely encouraging, telling me how they got through their own expeditions in beautiful Edale. One of the pupils, originally from just outside Paris, suggested I might like to take on the Tour de France next year. I think I’ll take on one Challenge at a time! Coming up today’s biggest hill early on in the ride I very nearly came to grief when I went the wrong way with the gearing. Instead of selecting a nice easy one to spin up the hill I found myself pushing like fury on pedals that were refusing to rotate. I was too worried about changing gear by then as we were on the steepest section of the climb and the chain was under pressure and I didn’t want to risk breaking it. At this point I began to look to see how soft the verge was. Thankfully a bail out was not required as the very athletic Jamie managed to uncleat one of his feet and bunny-hopped alongside me giving me a huge shove which gave me enough momentum to take me up the rise. The great thing about riding in a peleton is there are lots of people to provide a helping hand. The bad thing is if you go down you are probably going to take quite a few of them with you and all I could think of was the carnage I was creating behind me! Happily they had all seen (and heard) what was happening and just managed to avoid a pile-up. Of course cycling in the open countryside does bring its challenges aside from the hills and our route through North Yorkshire didn’t take us past many places to stop. Fortunately the lovely staff and volunteers at Jerry Green Dog rescue kindly let us pop in for a pit stop. It was at that moment that we all had visions of us leaving with new four legged friends in tow and I was hugely tempted by some of their gorgeous rescue dogs. However, I’m not sure how much our two dogs Willow and Martha would welcome another addition to the family! We had lunch on the village green at Tollerton before heading off on the remaining miles to our stop for the night. This was deliberately a ‘lighter’ day following the last two punishing ones, although when I first took up this sport I honestly never thought I would think of cycling 50 miles as a ‘light’ day! The team has been very relaxed today, sharing videos and messages from friends and family. One of my favourites has been the message from The Big Sing Community Choir who sang ‘Ain’t no stopping us now’ to the team for inspiration. Thank you to them and to everyone who has been in touch, your support means a huge amount to all of us. This morning we woke up to a grey day and our first sight of rain. We have been incredibly lucky with the weather so far, so perhaps we were due some, but having checked my weather app on my phone I was confident that it would dry up before we left York and sure enough it did. As we left our overnight stop we met with some wonderful young people from Fulford and Canon Lee schools, all of whom had completed their Bronze Awards and who gave us a hugely enthusiastic welcome. The local media asked me why I had chosen to do this for The Duke of Edinburgh’s Award. I explained how I had seen first-hand how the Award affects young people all over the world in the same way. No matter what their background it has the same impact. It offers them experiences they never thought they would have, gives them confidence they never imagined and challenges them in ways they didn’t think was possible. They come away with better communications skills, confidence and a genuine sense of achievement. It gives them a definite leg up in a world where getting ahead can be difficult and many businesses are recognising the DoE as the most important non-academic qualification for a young person to have on their CV. For those for whom life hasn’t dealt the kindest of cards it represents a real opportunity to turn things around and in many cases it has even saved lives. How it achieves this is simple, the young people are shown the way, but every achievement is their own, therefore they own the outcome. So, back to today’s ride…The sun came out right on cue as we left York and we had a glorious ride along some very pretty country lanes for 30 miles and our first stop (yes in a cake shop). It is obviously muck spreading season and as much as I appreciate the importance of fertilising the fields, every day has provided us with some lung-busting pongs! Our ride took us through North Yorkshire, South Yorkshire and on into Lincolnshire which now means we are over halfway mark. Our wonderful military support vehicle which looks after us and the bikes very well also provides a vital comms link with the outside world, today keeping us up to date with the most important news of the day - that Mary Berry has resigned from The Great British Bake Off! Maybe my new found love of cake could be put to good effect! So 80 miles completed today in 5 hours (in the sunshine too) and I am feeling great. Admittedly my backside was asking me nicely to get off the saddle by the time we finished, but apart from that all is good! After a lovely evening in Lincolnshire we headed out on another sunny day. We were seen off by bronze DofE Award holders and teachers from Giles Academy in Boston. They were full of stories about their expedition in the Peak District and the volunteering they had taken part in, helping younger children with reading and maths skills. They were extremely eloquent about the confidence in their abilities it had given them and their delight in the new skills they had learnt, including developing a sense of direction and the ability to cook Polish sausages in the open air! Any aspirations I had of an easy 50 mile day through the relatively flat countryside of Lincolnshire were quashed, as it rolls incessantly. Everyone else clearly had had far too good a night’s sleep last night, as what we didn’t have in monster hills we made up for in speed. Combined with a reasonable head wind it meant that today felt more akin to one of my harder training rides. However, on the up side we travelled through some very picturesque villages to Corby Glen where, after 30 miles, we stopped on the green for a picnic. We happened to be near a children’s playground in which some of the team decided to stretch their legs. Oli, the baby of the team at 28, and the tallest at 6ft 4, looked hilarious sitting on a child’s swing. Sadly he refused to let anyone take photographs of him in case his regiment think he’s not working hard enough! During our break I saw a video of my husband in Guernsey yesterday cycling on a bike for all of 30 seconds. Call that a bike ride?! He has a long way to go before he can join our peleton! I can hardly believe that we now only have one and a half days to go. The hills of Scotland and Northumberland feel like a life time ago already, however, tomorrow is a long hard day and we have now been pedalling for five days, so wish us luck! I shall definitely be pace monitor tomorrow! 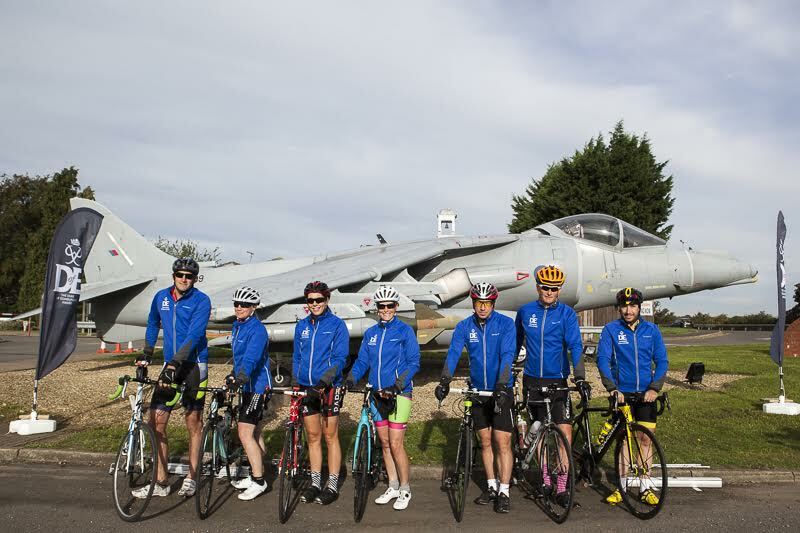 Arriving early at RAF Wittering yesterday we cycled around the base, stopping for a photo with the ramp from where harrier jets used to take off when training for operations. It was at this point after a fast ride in great conditions that things started getting silly. Being on an airbase prompted formation cycling attempts whilst humming the music to ‘633 Squadron’, and adopting even superman poses on the move. I drew the line when Jamie started putting his legs over the front of the handlebars deciding that a night in A&E may not go down well. After the best night’s sleep I have managed so far we awoke to yet another sunny morning. Before leaving Wittering I met some young people from Voyager Academy and the Peterborough Open Award Centre. There are many Award Centres around the country for young people who wish to access the programme but where it may not be offered through their schools. Of course it is also not just delivered through schools but a whole variety of projects and institutions for young people, from youth centres to special needs groups, from youth offenders schemes to cadets. Where there are young people you will usually find the Award. We cycled through Cambridgeshire and Northamptonshire into Bedfordshire, through some of the prettiest towns and villages of our journey. Apethorpe, Oundle and Pilton were picture perfect and we all moved into various houses along the way in our heads. We really needed to concentrate for the greater part of today as there was quite a serious headwind which proved challenging. Sometimes coming from the front, from the right and even from the left, there was nowhere to hide from it. After one period of unusual quiet in our team I was cycling next to Jo and just behind our leaders, Jamie and Roy. It was at this point I asked her what it was that she was staring at. She confessed that for the last 45 minutes she had been obsessing about the seams on Jamie’s shorts as to whether they were straight! Well that was it, poor Jamie now has a complex about his rear end and us girls of the team have now got something different to discuss. Part of my training meant I had to learn the cycling etiquette for signalling to each other warning of turning, pot holes, uneven surfaces, parked cars, etc. Sometimes when you are cycling too fast to let go of the handle bars or you are on bumpy terrain, rather than signal we shout to each other. So earlier in the day when Jo was at the back of the pelaton I heard her shouting on regular occasions ‘HOLE!’, ‘BUMPS’…. However, as there was no one for her to be shouting these valuable instructions to we have been teasing her that she has got an imaginary friend. So whoever is now at the back has to inform Jo’s little friend of what’s coming. It’s been a tough day today, cycling over 80 miles, climbing over 1,000 metres and with that headwind I had been slightly dreading it I will admit. But I have really enjoyed today and all that it threw at me. We are now finally on the home stretch and there is only one more day to go! We are all looking forward to seeing our families tomorrow and are hugely grateful to all of them for looking after children, dogs, houses and even tortoises while we’ve been away. Wish us luck for the final leg of this fantastic journey! What an incredible day! We had the most wonderful send off from the beautiful RAF Halton. The band of the Thanet Air Training Corps got us on our way us with a cheerful rendition of Diamonds are Forever and this set the celebratory tone for the morning. The unfortunate local DofE young people who were meant to wave us off got lost on the way but with typical DofE resourcefulness the team managed to find a local school group on the final leg of their expedition to come and say hello. Good luck for the final leg of their expedition to the young people from Misbourne School, I hope the weather is kinder to you on your march home than it was for your camping last night! 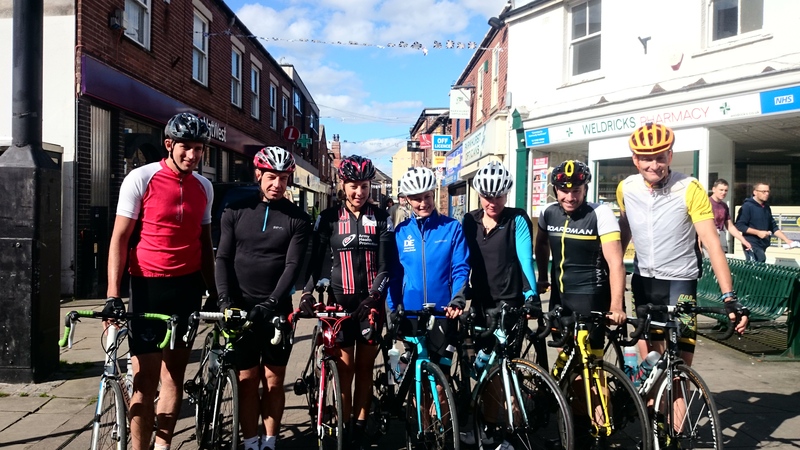 We were thrilled that Dame Sarah Storey joined us for the first half of our ride this morning. 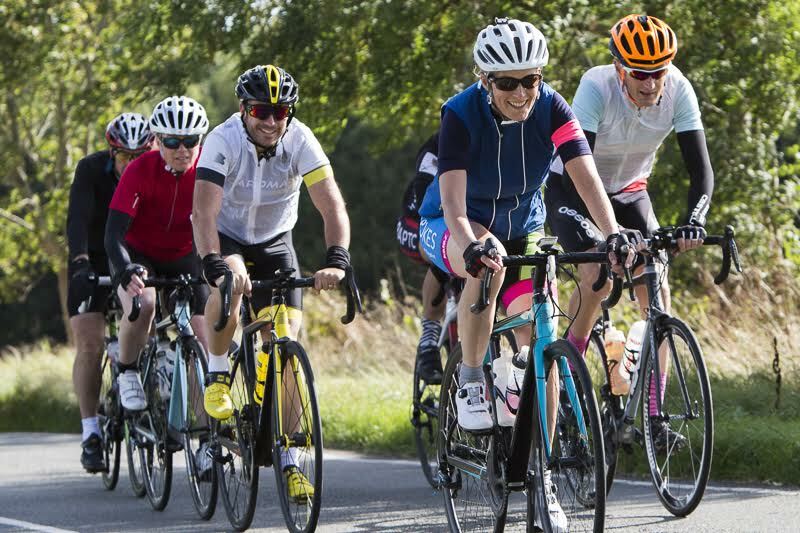 I admit I was somewhat daunted at the thought of cycling with the most decorated Paralympian ever, but she was fantastic and a delight to chat to as we made our way to Watford. Thank you for joining us Sarah, the team and I really appreciated your company. 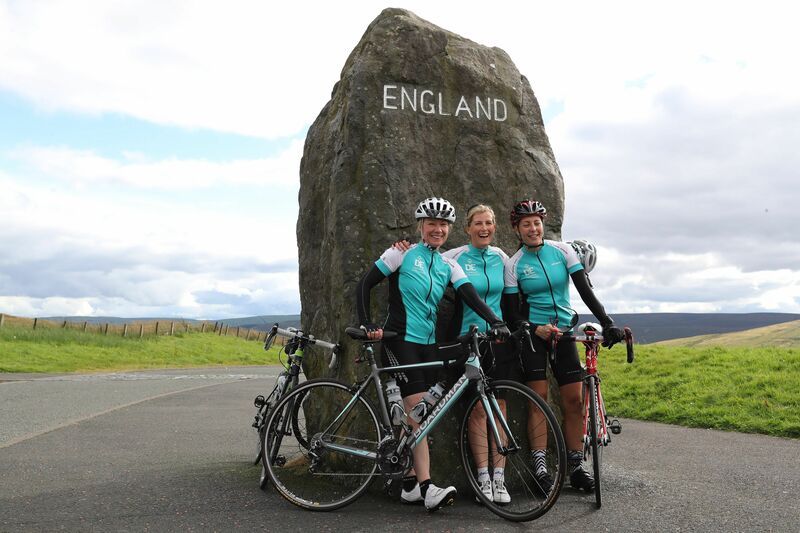 The road surfaces on the way into London didn’t make the ride easy, at one point Rachel apologised that she had stopped talking due to the level of concentration required, but we travelled the 38 miles knowing our friends and family were waiting for us. I have to say I shall never forget the experience of cycling down The Mall and seeing Buckingham Palace in the distance. I felt a huge sense of excitement, tinged with sadness and an enormous amount of emotion that this great adventure was coming to an end. As we came through the south centre gate of Buckingham Palace, unbeknown to us, the household division of the Scots Guard were waiting and launched into a rousing rendition of ‘Congratulations’. Then it was time for family hugs and kisses as we were all greeted by the loved ones we have missed this past week. It was completely overwhelming as there were many more friends and supporters than I anticipated and I am so grateful to everyone for coming to see us arrive. Finally, I just want to say a huge thank you to the entire team for their wonderful support, good humour and yes, even the occasional shove up a hill! We have gelled so well as a team and shared the highs and lows of cycling; the beautiful scenery, the sense of freedom, the never ending hills and many funny moments! And none of this would have been possible without the support staff behind the scenes, I thank them all for their excellent planning and dedication to detail. Thank you also to everyone who has been reading the blog, sent in comments and videos, and donated to the wonderful cause that is The Duke of Edinburgh’s Award. Your money will go a long way towards enabling many more young people to access this incredible life changing programme and I am hugely grateful to you all. So, what on earth am I going to do now?